Posted on November 25, 2013 by Wuensch Construction Inc.
Excelsior Christkindlsmarkt: A Thanksgiving Tradition November 29th and 30th. 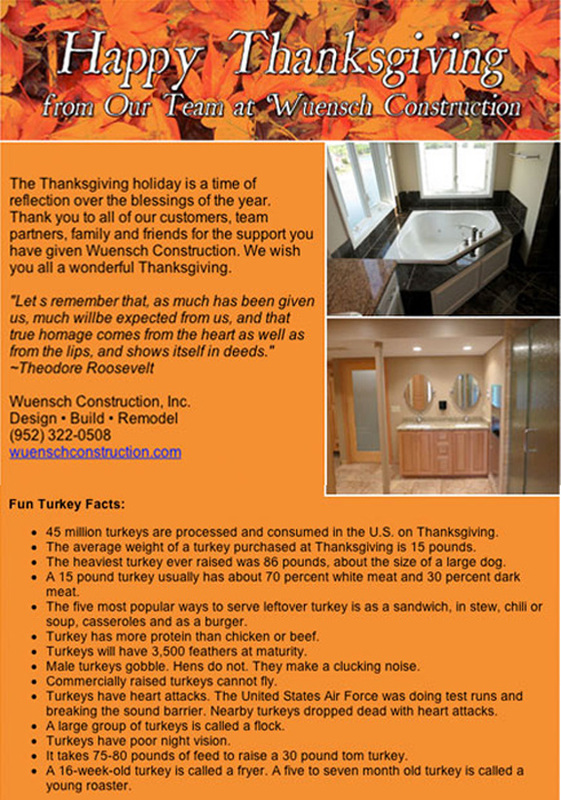 Posted on November 1, 2013 by Wuensch Construction Inc.
That time of year in Minnesota is right around the corner again and here are some tips from Wuensch Construction base out of Excelsior Minnesota to get your house ready for the winter. Check around doors, windows, pipes, vents for leaks and drafts that let heat escape. Seal them up with caulking and weather-stripping. If your windows and doors leak really bad, consider replacing them with newer ones that are more efficient. Check your attic for holes that penetrate your ceiling like plumbing stacks, wiring runs that would let heat escape around them. Seal them up with can foam insulation. If you have masonry fireplace not in use, do not forget to close the damper. Check your attic for adequate insulation and ventilation, if needed this can be the most cost-efficient way to cut home heating costs. If this problem is not resolved it could cause ice dams and do damage to interior walls and ceilings. Do not forget to check for attic ceiling penetrations. Weather strip and insulate your attic hatch or door to prevent heat lost escaping into your attic. Have your furnace tuned up by a professional in the fall of the year to ensure it is in top working condition for the winter. If your furnace is old pre-1977, consider replacing it with a new 97 percent high-efficient furnace. This could cut your natural gas use nearly in half. Replace your heating air filter monthly this will make your furnace work less, use less energy, and run more efficient. If you still have an old dial thermostat consider replacing it with a new programmable thermostat. This could cut your heating bills from 20 percent. If your hot water heater is older than 10 years consider replacing it with a new high efficient hot water heater. This will cut your heat costs. Turn your water heater down to about 120 degrees in the winter, this will feel a lot warmer than in the summer and save you money. Insulate your hot water pipes this will keep your hot water warmer longer. Clean out your dryer vent, this will make your dryer more efficient and save you money. 1. Unless your outside waterspouts are frost proof, make sure you drain them before winter.